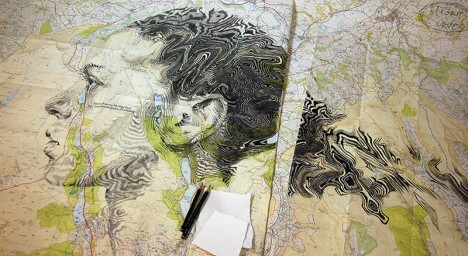 Rivers become veins in detailed portraits, mirrored city blocks resemble modernized Persian rugs and urban topographies emerge from rolls of tape in these map-based works of art. 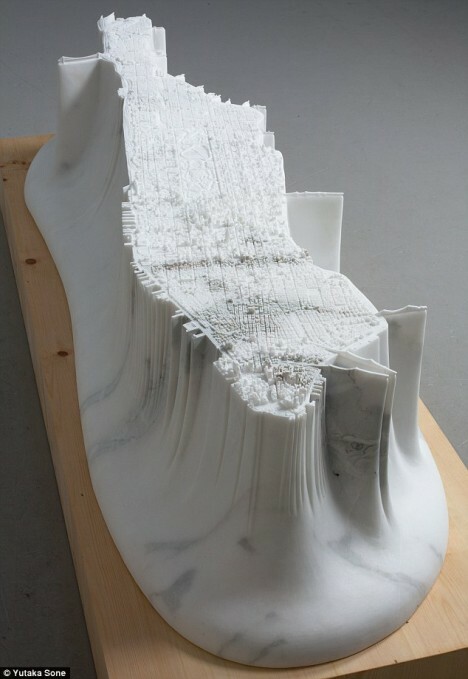 Some create the images of cities, countries and continents from unexpected materials, like Manhattan rendered in a 2.5-ton block of marble, while others use complex aerial imagery and cartography as an unexpected medium for drawings and sculpture. 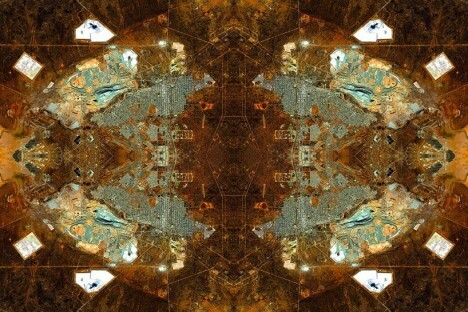 Images composited from Google Maps screencaps are reconstructed piece-by-piece into mirrored images inspired by Persian rugs in ‘Anthropocene,’ a series by David Thomas Smith. 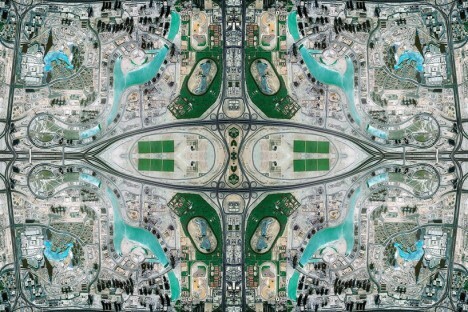 The Dublin-based artist chooses locations that are centers of global capitalism, including Dubai, the Beijing International Airport, and industrial sites like the Delta Coal Port in Vancouver, British Columbia. 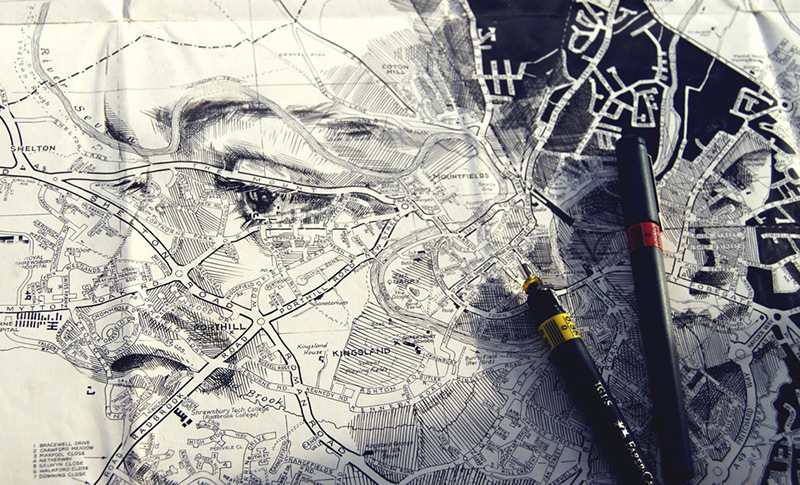 “This collision between the old and the new, fact and fiction, surveillance and invisibility, is part of a strategy to reflect on the global order of things,” says the artist. 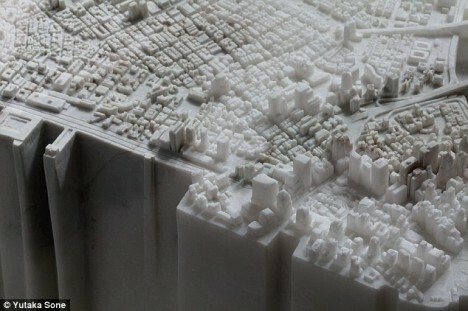 Japanese sculptor Yutaka Sone did, in fact, use Google Maps and aerial photographs to render an accurate replication of Manhattan in this whopping 2.5-ton block of white marble. 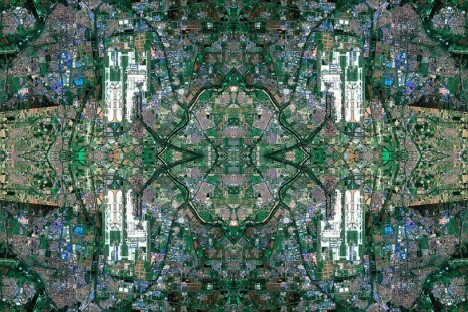 But most of his inspiration actually came from a series of helicopter rides in which he got a feel for the city, ultimately carving it as if it were an elevated plateau. The details of the sculpture are so accurate, residents of the city can locate their own buildings by counting the blocks. 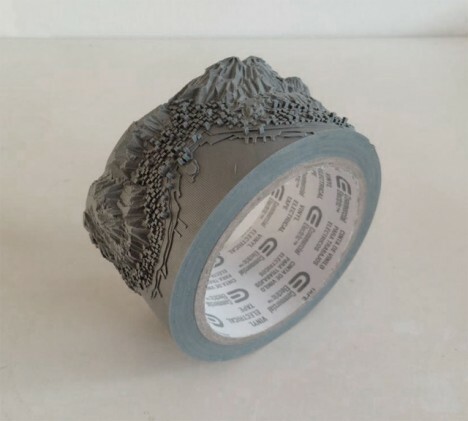 Best-known for his intricate thread sculptures, Japanese artist Takahiro Iwasaki has also created topographical maps carefully sliced into fat rolls of gray and blue electrical tape. 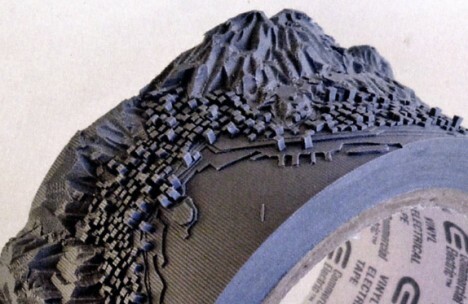 The landscape replicated on the gray roll is Victoria Peak, a mountain located on the western half of Hong Kong Island. 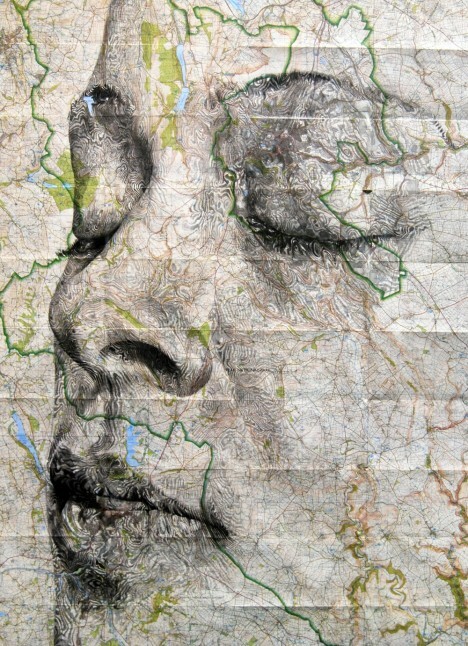 Ed Fairburn uses paper maps as canvases for incredibly detailed portraits, rendering human features as topographical landscapes on top of street maps, star charts, railroad blueprints and other types of maps. The portraits seem to blend seamlessly with the landscape features, with rivers and roads running through them like veins.